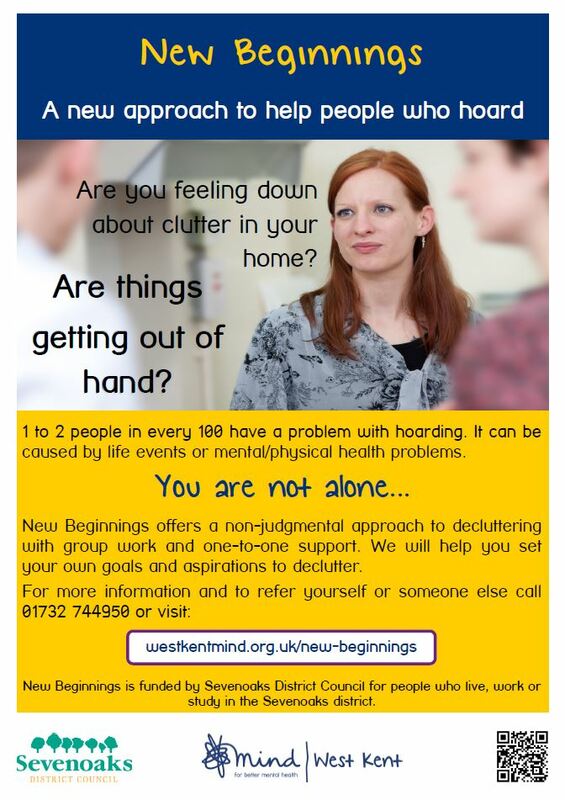 New Beginnings is an innovative new pilot project for people in the Sevenoaks district who have problems with hoarding and self-neglect. The project aims to improve the mental/physical wellbeing of people who hoard and help prevent the need for statutory intervention. West Kent Mind will work to identify and support potential clients in conjunction with local partners including West Kent Housing, Sevenoaks District Council, Citizens Advice Bureau and Kent Fire and Rescue Service. The 12 week programme includes 6 therapeutic group support sessions which will be facilitated by a counsellor, and 1:1 support from a Declutter Buddy. Clients will be sensitively and appropriately guided through their difficult journey. Declutter Buddies are experienced support workers and volunteers who will also attend the therapeutic group and, by invitation only, will support clients in starting to declutter and re-organise their homes. Clients will also be supported to achieve their personal goals which will be set during the group therapy sessions. There will be an opportunity for additional support after the 12 week programme if it is required. To be eligible for this programme you need to live in the Sevenoaks District Council area. The project is funded by Sevenoaks District Council. To make a referral please visit West Kent Mind. Previous Funding available: how would you support people in Kent?